I wanted to share a few examples of the different types of albums I offer. I really love designing albums! Your photos tend to live on your computer in a folder, so having something tangible on your coffee table or bookshelf brings your images life. Being able to look through your album whenever you’re feeling a #throwback is the best thing! My albums are printed on archival photographic papers and handcrafted with great attention to detail. 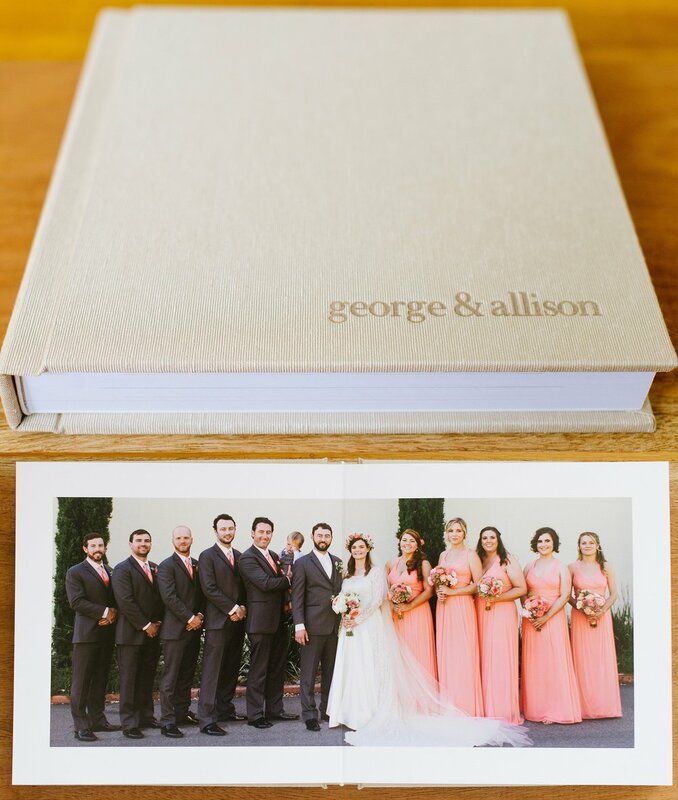 I offer albums with seamless spreads and beautiful cover options and personalization. First up, my high quality flush mount albums with thick bound pages that can be ordered with a leather or linen cover in different color options. Each spread lays flat when looking through your album and this type of album embodies the traditional, classic look that most couples order. And now my softcover book! A custom photo cover book with thinner pages and spreads that do not lay flat. If you album budget isn't as high, this is a great option to still have your photos printed in high-quality and a beautiful way to look back on your wedding day. The cover text is fully customizable. You don't have to decide to order an album before your wedding! Once I send you your complete gallery and you fall in love with your images :), I would be happy to design an album for you!! Definitely ask me about my album pricing and size options as we chat about your wedding. I cannot wait to design one for you!